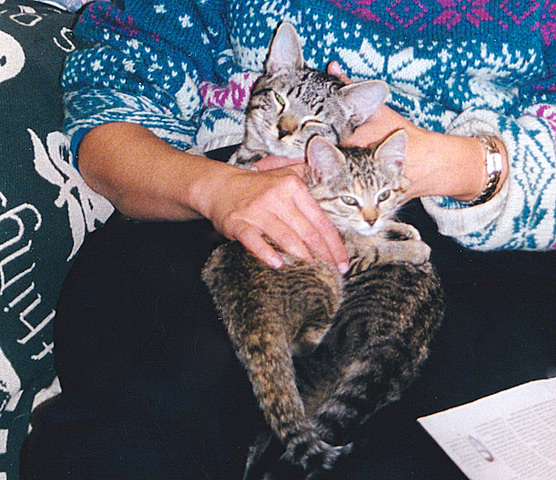 Pepper and Honey were inseparable – even here, on the very first day in our home in 1999. Sometimes we know the end is near, and we prepare. That did not happen in my marriage. Having professed his eternal love for me just a few days earlier, one sunny Sunday October morning my husband simply left the house – the door left wide open – drove to Canada, and never said goodbye to anyone: not me, not his best friends of 25 years, and not our cats – whom he insisted we acquire not long after we married. All my life I’ve been a dog lover; yet my husband insisted on cats and cats only, so felines became our pets. He filed for divorce and notified me by email, refusing counseling and refusing to talk to me, to our pastor, to friends and relatives. As the unwanted divorce unfolded for nearly two years, I could step back and more clearly trace the progression of his pervasive mental illness: so subtle, masked, and insidious. Even the pastor who married us characterized his cruel, disturbing actions as “evil incarnate.” In my husband’s absence the cats, Honey and Pepper, attached even more deeply to me, as I realized I was filling for them a void that I equally shared. My love for my felines was immeasurable. As time passed, that strange, mysterious husband was slowly forgotten by wife and cats alike. There was not much I could do beyond saying goodbye, slowly, when I learned Pepper, my devoted 16-year-old feline friend, was in the final stages of chronic renal failure. I did not, could not, see the signs of his insidious illness — so subtle and masked. Night after night, Pepper snuggled his head into the crook of my arm, relaxing his furry body into my lap as I subcutaneously hydrated him, needle just so under the skin. In the first days Pepper resisted, protesting, but then yielded to the needle that fed him, mainlining him nourishment, fluids, and comfort. When I gently removed the needle, Pepper would melt like a ragdoll, collapsing his body deeper into my lap. At the animal shelter, Pepper leapt into my arms and would not leave, as he did in this 1999 photo and repeated for the next 16 years. Day after day, year after year Pepper was by my side – almost dog-like – in his devotion to me. Pepper did not go easily, and I am haunted by his face gasping at me in that sterile exam room as euthanasia’s death drug flowed through him – like, “Why? I am fighting so hard to live! Why are you doing this to me?” My guilt was overwhelming, even as I dug his grave and buried him in the backyard. Also 16 years old, she and Pepper had been a pair from Day One, brought home together from the animal shelter. Honey was born there, while Pepper had been badly abused, rescued, and waited for three months at the animal shelter for someone to choose him. I chose him. The two were inseparable; in 16 years Honey and Pepper were never apart – not one day, not one night. In her 16-year life, Honey proved to be the smartest cat I had ever known, with sweetness in spades. When Pepper died, Honey threw up, repeatedly. I chalked it up to the stress of loss, grieving for her mate; gradually those episodes diminished over several weeks. But just a few days ago – four months since Pepper’s death – Honey started throwing up again. Her cat food was untouched, yet her water bowl almost drained; occasionally her breathing was labored and asthma-like. I took Honey to the vet, who gave her a Cerenia shot to stop the vomiting, and also drew blood for testing. The next morning I left for work, with a quick goodbye to Honey who was her usual self: sweet, perky, and reluctant to leave my lap. However, at work the vet called with bad news about the blood work: like Pepper, Honey was in the last stages of renal failure. How could this be? Honey seemed fine to me: energetic, engaging, so sweet. I wasn’t aware of signs of such an insidious illness developing in her: Honey’s symptoms were so subtle, masked. When I arrived home that evening and opened the door, Honey was not there to greet me. I heard ungodly painful meowing; Honey was prone on the floor, unable to move, soaked in puddles of urine, mucous-like diarrhea, and vomit. I scooped her up, cleaned her, tried to calm her, and rushed her to the vet as fast as possible before they closed – their phone line was already shut down – but Seattle traffic curses all into impatient standstills. When I finally arrived, the vet had already left and the clinic was locking its doors, but a young tech offered to look at Honey. “She’s in a lot of pain, and she really needs to be euthanized,” he said. I bargained with him, again and again begging for a pain med to give her, and then I’d take Honey home and let her die in my arms. “She would still be in pain, whatever we could give without a doctor here. She really needs to be euthanized.” How can this be? Honey was fine just hours earlier; the only difference was the Cerenia anti-nausea shot they gave her. Was that killing her? And did it matter now, anyway? Honey needed to stop vomiting, and that drug was the first line of treatment. Tearfully, I finally agreed to drive five miles to the emergency hospital to have Honey put down. But in Seattle that five miles could have been 50; I crawled through rush-hour traffic, with Honey’s labored breathing and meowing from the passenger seat. As I pulled into the hospital’s last parking space, I turned off the car’s engine, reached over to pick up Honey, and heard her whimper softly, and then a long breath, like a sigh. Then… silence. Out of the night darkness and into the hospital’s bright lights of a cold, stainless-steel exam room, I laid Honey down, and knew – knew – she was dead. Honey was dead, even as her heart was still beating. Honey and Pepper’s graves are marked with recycled things: 1941 bricks, granite oval slabs, and a cast-off cat made of metal, left by the previous homeowner. In this morning’s relentless Seattle downpour, I dug a grave in the backyard and buried Honey next to Pepper, these lifetime furry partners united once again. Two oval granite pieces – leftovers from a bathroom remodel – became their grave markers. Fake flowering dogwood branches I’d rescued from the trash became their last bouquet. A bit make-do, but it will do. Then, for the first time in 16 years, I walked into an empty house completely devoid of life, love, and relationships. On my wedding day 16 years ago and every day after, I promised my husband to love him forever, until death. He left, with no goodbye. On the adoption day of Honey and Pepper 16 years ago and every day after, I promised to love them forever, until death. They were my inseparable companions who filled the void of a marriage lost, teaching me love, devotion, faithfulness, and the power of relationships until death parted us today. Tags: animal shelters, cats, Cerenia, death, dying, euthanasia, faith, felines, Helen Holter, pet aging, pet loss, pets, renal failure, subcutaneous hydration, veterinarians. Bookmark the permalink.